Summer is always a busy time of year for researchers studying Antarctica and the Southern Ocean. Here’s just some of what the ACE CRC’s scientists got up to during the past few months. Researchers from the ACE CRC and Antarctic Gateway Partnership completed a successful ninth season of ICECAP, the groundbreaking international science partnership transforming our understanding of Antarctica’s ice sheet. The ACE CRC’S Dr Lenneke Jong led a team of three Hobart-based scientists, including Dr Felicity Graham from the Antarctic Gateway Parnership and IMAS PhD student Wilma Huneke. They together formed the Australian contingent of a larger international team involving scientists from the USA, UK and France, and led by the University of Texas Institute for Geophysics (UTIG). For the past decade, ICECAP has been employing a suite of airborne instruments, including radar and laser, to produce a detailed map of East Antarctica’s topography in three dimensions, right down to the bedrock and ocean below. This year’s season saw the team focus special attention on the critical ocean-ice threshold at a number of locations near Casey Station, including the Totten Glacier, the Moscow University Ice Shelf and the Shackleton Ice Shelf. They completed over 13-thousand kilometres of survey over ten flights from the Casey skiway. Dr Jason Roberts, with an AXBT last season. In addition to the airborne ice penetrating radar, the team added a new tool to their data gathering arsenal that enables them to measure changes in ocean properties that could affect glacial melting. A total of 15 airborne expendable conductivity-temperature depth probes (AXCTDs) were deployed to measure the properties of the ocean around key glacial outlets from of the Totten, Moscow University and Shackleton Ice Shelves – along with 25 airborne expendable bathythermographs (AXBTs) to measure ocean temperature. The field season was supported by the ACE CRC and the Australian Research Council Antarctic Gateway Partnership. During December and January, a team of Australian ice core researchers embarked on a deep field expedition to recover a 2000 year old ice core from Mount Brown, inland of Davis station. The five researchers and two deep field support specialists, led by Dr Tessa Vance, spent nearly two months drilling a core to a depth of around 350 metres. The core is expected to provide a snapshot of the climate history of the Indian Ocean, and hopefully an insight into climate variability in Australia over the last one to two millennia. The region is known as a ‘cyclone nursery’ as it’s where many storms are born before they head from west to east across the Southern Ocean and impact both Australia and East Antarctica. The work forms part of the ACE CRC’s Antarctic Climate Variability of the Past 2000 Years project, which is constructing a detailed 2000-year climate record using ice cores extracted from the Australian Antarctic Territory. Researchers unloading gear from a Twin Otter ski plane, to begin setting up at the Mount Brown field camp. While drilling was underway at Mount Brown, a team of scientists from Tasmania and the United Kingdom were continuing fieldwork on the nearby Sørsdal Glacier. This ongoing field project at Sørsdal is investigating surface melting of the glacier, and the formation and drainage of surface ponds on the ice. Monitoring tower connected to a buried seismometer on the Sørsdal Glacier. This season a team of geophysicists installed a number of seismometers to track water transport in the ice, and conducted thorough mapping of water on the glacier using airborne ground penetrating radar. Data collection will continue with a monitoring tower left in place to track meteorological conditions and lake development. The project is led by Professor Christian Schoof from the University of British Columbia, with involvement from the ACE CRC’s Dr Sue Cook and Dr Ben Galton-Fenzi. The work forms part of the ACE CRC’s Ocean Forced Evolution of the Antarctic Ice Sheet project, which is working to understand how the Antarctic ice sheet is responding to a warming ocean, to improve projections of future sea level. The Southern Ocean plays a central role in the global climate system and, in early January, RV Investigator left Hobart on marine science voyage aimed at building on our understanding of these processes. The team of researchers, led by Dr Steve Rintoul from CSIRO, had a long list of science objectives for the voyage that included the deployment of 11 next generation deep-water Argo floats near the Antarctic edge. These new data-collecting, autonomous ocean robots were successfuly released and are floating freely on the Antarctic circumpolar current, providing real-time data to scientists on temperature and salinity at depths of up to 5000 metres. The existing global network of over 3800 Argo floats currently provides data on ocean properties down to only 2000 metres. Data from the next-generation probes will help fill a need for comprehensive and continuous measurements over a broad scale, a task that is difficult to achieve in the Southern Ocean using shipborne measurements alone. The floats were supplied by the Scripps Research Institute (USA), Japan Agency for Marine-Earth Science and Technology (JAMSTEC), and Laboratoire d’Océanographie et du Climat (LOCEAN, France). Researchers also used January’s RV Investigator voyage to collect new oceanographic data along a route known as the Southern Ocean Repeat Section, or SR3 Transect. The SR3 Transect runs north-south between the south coast of Tasmania and the coast of Antarctica at approximately 140°E, and is one of the most well-trodden scientific navigational routes in the Southern Ocean. The ACE CRC partnership has been conducting regular observations along this line since 1991, collecting samples of the water column at regular intervals and depths. Regular sampling along the transect enables scientists to measure long-term changes in ocean circulation, trace chemistry, pH, biology, temperature and salinity. After 27 years of continuous sampling, the SR3 time series has become an immensely valuable archive of data for climate science, providing researchers across many disciplines with a high-resolution dataset showing changes in ocean properties linked to climate. Researchers on the same voyage also carried out additional sampling upstream and downstream of the SR3 line, to try to better isolate changes in Antarctic Bottom Water formation from the Ross Sea and from the Mertz Polynya. The voyage included additional scientific studies of trace metal biogeochemistry by Dr Andrew Bowie, and of ocean carbon uptake by Dr Bronte Tilbrook. Crew aboard RV Investigator deploy a CTD in 2017. While oceanographers studied the water below, atmospheric scientists from Australia and the United States were collaborating on a major project aimed at understanding the role of Southern Ocean clouds in the climate system. Clouds of made up of super cooled liquid water below freezing point are common over the Southern Ocean, but relatively little is known about their influence on weather and climate. For weather forecasters and climate modelers, these super-cooled clouds represent one of the largest uncertainties in the prediction of the future climate of the Southern Hemisphere. On voyages throughout the summer field season, the icebreaker Aurora Australis, and RV Investigator were equipped with an array of high-tech sensors for gathering information on the clouds. The United States Gulfstream V aircraft that flew from Hobart over summer to study clouds over the Southern Ocean. (Photo: National Science Foundation). In the air, a United States Gulfstream V research aircraft, owned by the US National Science Foundation, collected information on the thermodynamic and physical properties above, below and within clouds. Weather balloons were also launched at regular intervals to measure temperature, winds and humidity above the ocean. The data will feed into climate models to improve global weather and climate forecasts in the high southern latitudes and across the globe. The project is led by Dr Alan Protat from Bureau of Meteorology, with involvement from Dr Simon Alexander (AAD/ACE CRC), while much of the equipment was provided by the US Department of Energy’s Atmospheric Radiation Measurement (ARM) Mobile Facility. In March, the second voyage of the RV Investigator for the season took researchers south again to deploy a new mooring in the Southern Ocean Time Series (SOTS) facility. 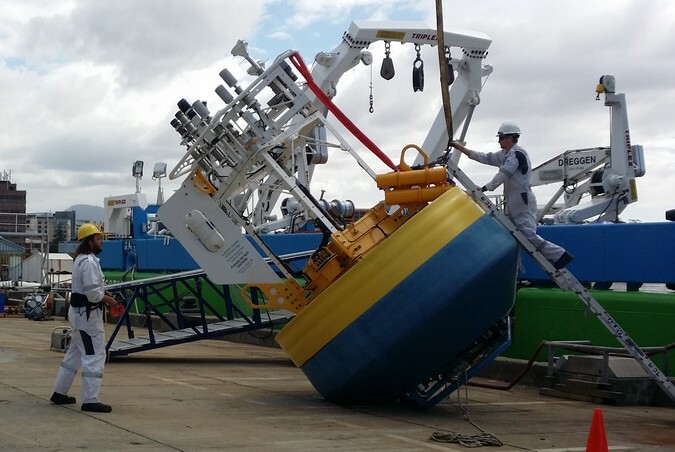 The SOTS moorings are part of Australia’s Integrated Marine Observing System (IMOS), and are comprised of a number of components including a deep ocean sediment trap mooring, a surface biogeochemistry mooring and an air-sea flux mooring. Technical problems with the meteorology & biogeochemistry mooring unfortunately prevented its deployment this season, however the team on board were able to successfully recover and deploy sediment traps in the same area. Sediment traps are cones which catch and store falling marine particles in collection cups, providing a record of organic carbon sequestration in the deep ocean. The voyage also accommodated an additional biogeochemical project involving 20 scientists and led by University of Tasmania biogeochemist, Professor Phillip Boyd. This project involving Hobart, interstate and international scientists complemented the time series study at SOTS by providing additional insights into carbon and iron biogeochemistry at this sub-Antarctic location. It also provided a further opportunity to build on ACE CRC’s Biological Responses to Environment Change research project, with post-doctoral researcher Robert Strzepek leading a study into environmental controls on sub-polar microbial foodwebs. Since 1997, the SOTS facility has been providing critical insights into how the ocean and atmosphere exchange heat and carbon, and how these processes impact ocean biology. Located about 600 kilometres southwest of Tasmania, the site is particularly vulnerable to the extreme weather events that typify the area including very large waves, strong currents and severe storms, presenting significant technical and engineering challenges. In January, staff and students joined Japanese research ship Umitaka Maru, which has been surveying the Southern Ocean and investigating the role of zooplankton in the Antarctic food web. The voyage builds on a long-standing research collaboration between ACE CRC researchers and Japanese researchers at the Tokyo University of Marine Science and Techmology (TUMSAT) and the National Institute for Polar Research (NIPR). A key focus of the Umitaka Maru’s voyage this season was on grazing activities of zooplankton species in the marginal ice zone, and their role in the biological pump. ACE CRC zooplankton ecologist, Dr Kerrie Swadling, was joined by two students from Tasmania’s Institute for Marine and Antarctic Studies, Mao Mori and Abbie Smith. The students gained experience in conducting incubation experiments on zooplankton, to find out what they eat and how much, over a period of time. Zooplankton are microscopic animals that float in the ocean and provide food for larger marine creatures such as krill, fish, whales and penguins. The biological pump refers to the ocean’s biologically-driven sequestration of carbon from the atmosphere to deep sea water and sediment. IMAS PhD students, Mao Mori and Abbie Smith, aboard Umitaka Maru in January.